36. Technician A says the PCM will advance the engine's ignition timing when it receives a voltage signal from the knock sensor. Technician B says this sensor sends an AC signal to the PCM when it detects ping or detonation. Who is correct? Answer A is wrong. The PCM retards the engine's ignition timing when it receives a voltage signal from the knock sensor. Retarding the engine's ignition timing helps prevent detonation (knock). Answer B is correct. The knock sensor creates and sends an AC voltage signal to the PCM whenever it senses vibration from engine knock or ping. 37. Bank 1 Sensor 1 is the pre-catalytic converter heated oxygen sensor and Bank 1 Sensor 2 is the post-catalytic converter oxygen sensor. The waveforms above are compared to diagnose catalytic converter efficiency. 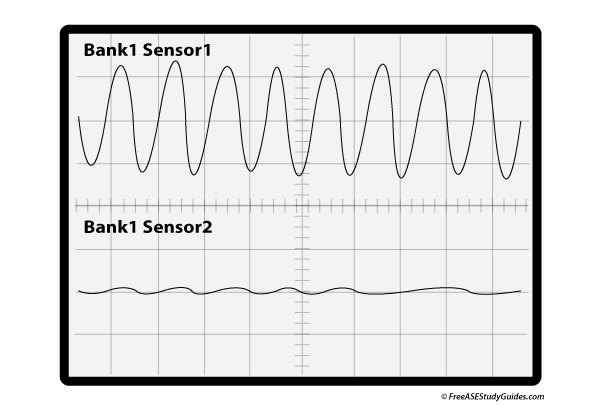 Technician A says Bank 1 Sensor 2 is faulty because the two waveforms should have similar voltage peaks and fluctuations. Technician B says Bank 1 Sensor 2 is the catalyst monitor. It monitors the catalytic converter’s ability to reduce pollutants in the exhaust stream. Who is correct? Answer A is wrong. Bank 1 Sensor 2 is monitoring the catalytic converter’s ability to reduce pollutants in the exhaust stream. It should have much less amplitude than Bank 1 Sensor 1. This is because most of the oxygen seen as voltage in the first waveform has been used by the catalytic converter in reduction. Answer B is correct. The catalytic converter uses the oxygen in the exhaust and from secondary AIR injection to breakdown harmful pollutants. 38. An engine with variable valve timing has a rough idle, but runs smoothly at higher engine speeds. Technician A says to check the variable valve timing solenoid and its associated circuit. Technician B says this problem can be caused by unchanged contaminated oil. Who is correct? Answer A is wrong. Manufacturers use different methods to accomplish variable valve timing. There are sprockets that smoothly advance valve timing and valve systems that increase duration and lift with separate cam lobes activated by lock pins and electromechanical solenoids. That's just two, there's more. Answer B is wrong. Unchanged oil is a big problem. These solenoids become clogged. If the actuator is not engaging or releasing it may be stuck. Passages get clogged from unchanged and contaminated oil and gel. Answer D is wrong. Both Technicians are correct. Tap or click the Read more… button for more information. 39. Technician A says an AF (Air/Fuel) sensor is designed to reach and keep an engine at stoichiometry. Technician B says stoichiometry is 15.7:1 air to fuel mixture. Who is correct? Answer A is correct. An Air/Fuel sensor is designed to reach and keep a vehicle at stoichiometry. Answer B is wrong. Stoichiometry is a (14.7:1) air to fuel mixture. This is an important ratio to remember. 40. An engine suffers from a lack of power during acceleration. A vacuum test is being performed. At 2500 rpm the vacuum gauge needle drops slowly to 10 "hg. Which of the following is causing these vacuum test results? A. A clogged catalytic converter. C. A faulty head gasket. Answer A is correct. If the needle drops steady during acceleration, there's a restriction in the exhaust. These test results are most likely caused by a restricted exhaust; a clogged catalytic converter. Answer B is wrong. Late ignition timing will cause a low vacuum reading between 10 "hg and 15 "hg. Answer C is wrong. A blown head gasket will cause an engine to overheat and allow coolant to enter the combustion chamber. This will result in white/gray smoke. Answer D is wrong. A burned exhaust valve will cause the needle on the vacuum gauge to fluctuate. Utilize your time, study between commercials when your watching TV. This way you get to skip that commercial and gain some study time. This is when a smartphone, laptop, or a good hardback study guide really comes in handy. This study guide works great on lots of different devices.